Of the various features that regulate our physical perceptions, sensory compensation is particularly fascinating. Its theory holds that sensual deprivation might actually enhance discernment, as one finds the body making up for diminished capacity in one area with what’s experienced as an increased acuity in others. (It’s widely held, for instance, that a loss of hearing is accompanied by elevated senses of vision and taste.) But studies suggest that what might outwardly read as increased faculty is in fact more a matter of heightened awareness: denied one form of information, it seems that the mind can actually train itself to reallocate its resources, devoting keener attention to what does remain discernible, bringing the surrounding environment into new sums of focus. To that end, one might point out that even within the deaf community, absolute impairment is rare. For the vast majority of people, hearing occurs in degrees, and for those of us with even the slightest capacity, the ear acts as a natural amplifier, increasing in sensitivity as stimuli recede. The more quiet an environment grows, the clearer our impressions of it become, with even the most unassuming elements taking on heightened effect. Consequently, we discover that what passes for silence is rarely ever so; a genuine emptiness, a pure lack of resonance, proves to be not only an acoustic impossibility, but also a perceptive one. Though measurements remain subjective, we may each still find that the less information is imposed upon us, the more acute our grasp of what is there can be – to the point where, even in apparent stillness, there is always something to be observed. “Silence,” then, is something of a misnomer - a question more of relative perception than of absolute principle. As such, to approach it as subject is necessarily to speak conceptually: that is, in terms of comparison, of equation, of discernment, of symbol. It seems reasonable to suggest that what rings true in biology might extend to aesthetics. In languages musical, visual and verbal alike, silence can be similarly understood as absence as opposed to emptiness: what’s notated as vacancy may nonetheless exert a performative weight. Within spoken exchanges, for instance, silence functions invariably as a form of discourse, a means of expressing sentiments ranging anywhere from indifference to contemplation, accordance to complaint. Within composition, it functions as a material, a structural unit quantified by duration and qualified through any number of effects. Each discipline formalizes silence in its own way: In poetic texts, writers use caesurae to mark the boundaries of prosodic passages, denote variances in intonation, and provide cues for interpretations both studied and spoken. In musical and motion-based compositions, meanwhile, composers rely on “rests,” fixed units of suspension set to varying lengths of time. 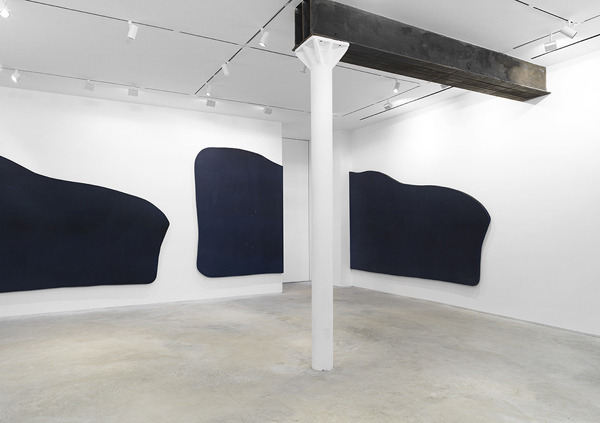 For their part, visual artists tend to measure silence more by effect than literal amount: in discussing Simon Hantaï’s pliage works, for instance, critics often liken the unpainted portions of his canvases to “visual silence” (2) – which is to say, a functional stillness which activates the composition, allowing it to unfold with purposeful rhythm. In each case, what may outwardly read as unoccupied space is employed and perceived as meaningful content. On purely formal terms, then, one might think of silence as just another tool at an artist’s disposal, there to be used in the service of structure. As silence can be said to function materially, so can it be employed strategically. As compositional elements go, silence is diverse: the same given material can be used to signify beginnings, intermissions and endings; to prompt anticipation, emphasis and release; to halt proceedings and initiate movement; to generate tension and provide resolution. In each applied instance, what ultimately defines its quality is context. The very nature of silence resides in relativity: defined essentially by what it lacks, it cannot help but insist on its opposite – which is, in turn, given shape by the space that surrounds it. Within artistic offerings, this reciprocity can be used to expressive ends, with a work’s fluidity and dynamism ensured through a thoughtful approach to the placement, duration and frequency of pauses. Silence draws our attention to the edges of things: giving clarity to structure, framework to form, affirming the function of context as content. In this sense, reticence-as-strategy is intrinsic to the creative impulse. At a certain point, however, some artists begin to consider the possibility of employing silence not merely as an element within a given composition, but rather as a medium in its own right. Modes of abstraction, reduction, distortion, negation: each similarly finds the artist moderating a given work’s explicit content in favor of elements left implied, obfuscated, open-ended or unresolved. As such, each in its own way reflects efforts made towards striking an intricate balance: that of negotiating the means of art without sacrificing its impact. In 1969, Marcel Broodthaers replaced the script of Mallarmé’s Un Coup de Dés Jamais N'Abolira Le Hasard (A Throw of the Dice will Never Abolish Chance) with solid bars of black ink. While retaining its original size and layout, Broodthaers translated the poem’s unruly syntax to pure image, isolating as subject the sprawling structure Mallarmé had embraced as both vehicle and content. Resonant even in its reduction, the resulting work confirmed what Rauschenberg had discovered sixteen years earlier in taking his eraser to a De Kooning: namely, that in the act of composing, deletion can be understood as a constructive act, the distinction less a matter of constitution than conception. Taken from another angle: “It is a mistake,” Deleuze writes, “to think that the painter works on a white surface.” He suggests that even before a mark is made, the support contains any number of potential images, both remembered and imagined; rather than building up imagery upon the canvas, it becomes the artist’s task “to empty it out, clear it, clean it… [to] determine among these [elements] which are an obstacle, which are a help.” (3) In his view, the production of an image must inherently begin with an act of elimination: a decisive purging of all factors not actively required. Of course, this operative silence needn’t stem from authorial intent: our ability to find beauty in architectural ruins, for instance, confirms the possibility of reading unintended vacancies as meaningful, even figurative. (As Sontag once remarked, it’s hard to imagine the Venus De Milo enjoying a similar impact with appendages intact.) (4) Still, one finds confirmation in such works – as in the ghost poses of Tom Friedman’s rubbed out centerfolds, the generative cancellations of Christopher Wool’s canvases, the thoughts and actions left implicit in Lydia Davis’ methodical narratives – that the withholding of content does not necessarily amount to its omission. There is always an offering, it seems, beyond what is readily seen or heard; even in erasure, nothing is ever truly lost. For some artists, this impulse to temper ones asserted content goes beyond matters of technique to become a mode of authorship in itself. Of course, one could say that to present a work of art to an audience is inherently an exercise in selectivity, the author purposefully balancing revelation and concealment so as to secure a desired impression. (All art is, in a sense, performance art.) There exists a particular lineage of artists, however, for whom formal reduction reflects a broader desire to remove self-reference from ones work: a kind of self-silencing in which the prescribed functions of authorship – expression, intention, elucidation and so on – are willfully obscured, even rescinded. The anti-illusionism of Rodchenko’s “Pure Color” canvases; the industrial precision of Judd’s serial forms; Stockhausen’s aleatoric compositions; Toshi Ichiyanagi's open-ended graphic scores; Arp’s chance-determined collages; and many more still: while each given strategy is employed to its own particular ends, they similarly confirm the progressive potential of an anti-subjective impulse. But if silence doesn’t function as such in physical perception or in formal composition, can we not assume that the same is true in authorial presentation? Carl Andre’s sculptures, James Meyers writes, “harbored a strange contradiction: in order to make matter appear ‘as matter,’ in order to bring its obdurate substance to the threshold of perception, he needed to arrange it in some way. He had to give it a form.” (5) Andre is hardly alone in this dichotomy. 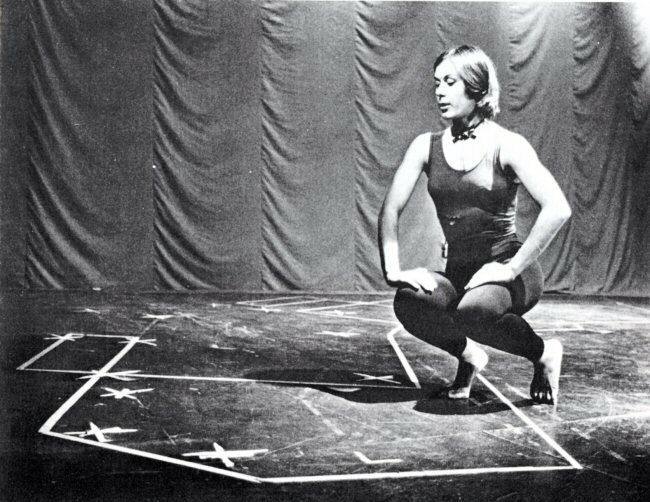 When arranging performances of exploratory pieces like Intersections and Projections, for instance, Morton Feldman specified each passage’s register and number of notes before allowing the pitch and melody to vary from concert to concert, musician to musician. Along similar lines, Cage’s “indeterminate” works are better understood as chance-controlled compositions: while divined from improvised rolls with the I Ching, a piece like Music of Changes would then be studied and performed note-for-note, and even 4’33”, the archetype of authorial non-obstruction, unfolds in three discrete movements of specific durations. In each case, what might outwardly seem a conflict in terms is merely affirmation of a basic truth: namely, that to compose is inherently to shape. The act of presenting an artwork is one requiring will, intention and, necessarily, some measure of framing – and design, besides being intrinsic, is always directive, never neutral. In even the most outwardly “silent” offerings, one finds an underlying structure, an authorial presence which, however subtle, serves as a means of instruction. In even the most hands-off strategy, the artist cannot help but leave fingerprints. The question raised by all of this, of course, becomes: to what end? What’s to be gained by actively courting ambiguity, distance, even abnegation in ones presentation? Motives and methods vary. Broadly speaking, anonymity has long afforded artists freedom from any number of upshots: expectation, prejudice, reproach, systemized discrimination, even prosecution. (Indeed, in discussing silence as authorial strategy, it must be acknowledged that for some, the exclusion of self-reference is a matter of imposed necessity rather than artistic design; in considering such cases, we are reminded that for one to relinquish influence willfully, s/he must first enjoy the privilege of having been afforded it.) Still, within a milder scope, the aims of authorial self-silencing can be divided into two essential models, each defined by the artist’s attitude towards his or her audience. While thoroughly modernist in premise, this remains a predominant, even presumed model for the artist/viewer dynamic, which for our purposes may as well be termed the Silent Treatment. In conversation, that phrase denotes an aloof but charged distancing; whether used as an act of defense or aggression (which, of course, are often one and the same), it serves variably as a method of avoidance, dominance, disempowerment and punishment. In affirming what is basically a stalemate scenario – i.e., a compulsion to communicate offset by the refusal of dialogue – the term proves an apt sum-up for what has become a standard dynamic in the formal viewing ritual. Within this first model, meaning-as-such such becomes a matter of declared statement as opposed to individual discernment: in deciphering content, one does not (cannot) read the work itself, but rather the explanation that accompanies and presumably legitimizes it. As the artwork’s immediate content exceeds the audience’s point of reference, opacity (or silence-as-“difficulty,” as it were) becomes desirable for being equated with gravity: to be readily engaged (let alone enjoyed) is to be presumed simplistic, while a certain degree of inaccessibility lends an edge to ones work, enhancing its perceived value. So far as s/he is seen to be “serious,” then, the artist is rewarded for imposing distance between artwork and audience, who in turn find themselves surrounded by items that seek their admiration but rarely allow for their participation. Though a remnant of an avant-garde one half-century gone, this first model remains a familiar and viable strategy, so common in practice that isolating particular examples becomes difficult. Suffice to say, I doubt that even the most astute of us haven’t at some point found themselves alone in a brightly lit room, confronted with stoic offerings that demand understanding but withhold the means for achieving it, the viewing experience reduced to the mere solving of riddles. While similarly rooted in detachment, the motives and effects of the second model diverge sharply: for where the first found silence used to inhibit audience entry, here we see it employed as a means of ensuring it. In this mode, the artistic impulse becomes one aimed not at self-expression, even self-representation, but rather towards self-transcendence; blurring the lines between presence and absence, the artist’s presentation here remains instructive but no longer insistent, centered as it is in exploring how much (or how little) one need impose of oneself while still fostering a meaningful exchange. Within this second model, the withdrawal of intention is purposeful, meant not to ensure mere opacity, but rather to suggest that an artwork might function on terms beyond the artist’s control. Here, self-imposed authorial silence can be seen as gesture aimed towards achieving a balance between all parties involved, with the viewing ritual recast as one centered in possibility rather than prescription, each given work lending itself to a multiplicity of potential narratives. There is a degree of allowance to this second approach that feels almost like generosity. It also brings to mind the kind of detachment one finds endorsed in certain Buddhist doctrines – specifically, those which suggest that to assert preference is invariably to limit, to hinder, to misapprehend. In Landon Metz, we find an artist firmly committed to this second authorial model. Long central to his practice has been the idea that an artwork’s intellectual grounding needn’t preclude an immediate, intimate and rich viewing experience: embracing each facet of his process as a potentially viable medium, Metz’s output takes form as lyrical, open-ended constructs whose content lies not only in the resulting objects, but also in the methods used to produce and present them. Recent years have seen Metz offsetting a willfully stylized aesthetic with an increasingly subtle touch, each succeeding project confirming a gradual but pronounced shift towards sparse composition, formal reduction, precise application and inventive presentation. This is especially true of his current body of work: a succession of serialized assemblages of varying scales, each rendered in colored dye on unprimed canvas. Arranging duplicate compositions into ruptured, repeating motifs, these latest works explore strategies of structural logic, their elaborate configurations – much like the resulting viewing experience itself – becoming at once linear and open-ended. With his first showing at James Fuentes, Metz extends these ideas by distilling his presentation even further: applying fresh strategies to familiar concerns, we here find the artist approaching the gallery itself as a medium in each sense of the word, his paintings now serving as tools implemented towards a broader meditation on the formal viewing experience. Installed sparsely along the perimeter of the room are a series of large monochrome canvases. 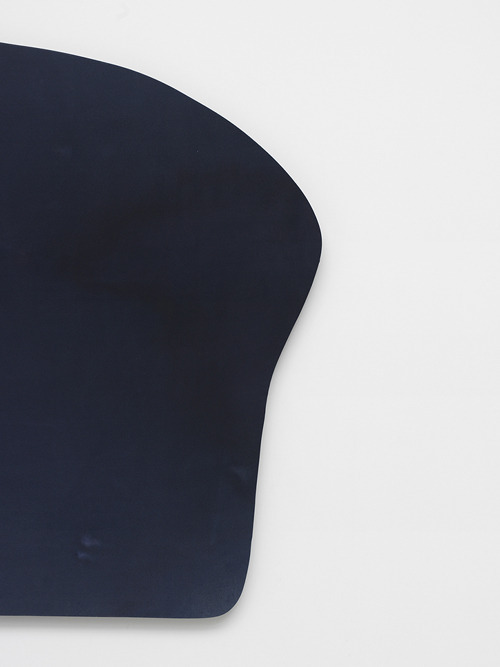 Manually dyed in the artist’s signature blue, the paintings reinforce any number of Metz’s longstanding strategies: a literal use of materials, the equated function of color and form, and so on. But where earlier works unfolded on conventional supports, here we find Metz having preemptively fractured his composition, isolating the painted elements into self-contained fragments and discarding whatever space might have remained. Clustered to meet at the gallery’s corners, the forms retain legibility but remain physically incomplete, made whole only in being perceived as such. 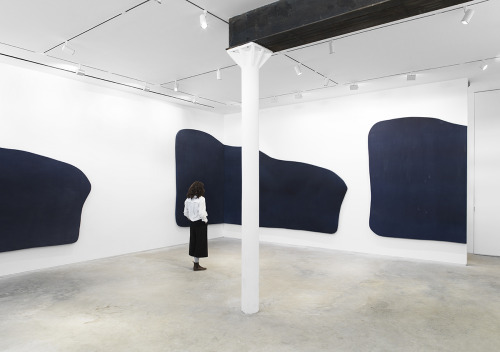 The forms themselves – curvilinear, organic, offsetting the simplicity of Matisse’s cut-outs with the exacting edge of Stella’s late-60s shaped frames – are familiar, having been drawn from the artist’s own previous canvases. It’s what Metz has eliminated in their wake, however, that demands our initial attention. 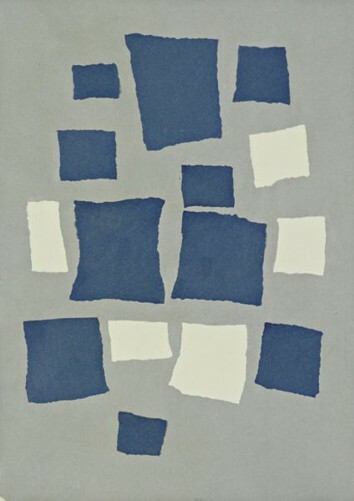 In previous works, the integrity of untouched canvas served two key functions: first, it played a vital compositional role, defining tone and form, confounding the very notion of “blank” space; second, its absorptive properties, combined with the bodiless nature of dyes, allowed for a perceived integration of medium and ground. In purging his work of this principal element, Metz encourages the viewer to find similar implications in the relationship between object and environment, effectively recasting the gallery itself as the pictorial plane, the walls as “canvases” in a single makeshift composition. The show’s layout is such that one finds gratification from any number of vantage points. Viewed up close, the paintings encourage a sense of immersion, with ones gaze sinking easily into indigo depths before being drawn back to the surface by the canvas’ still-intact texture. From this intimate distance, we find that unlike so many artists’ approach to the monochrome, Metz’s application does not shy away from signs of the hand. Indeed, though they may read as uniform from afar, each plane is full of subtle incidence: the shadowed gestures left by the artist’s palms as he pressed the dye to the canvas; the faintly rising impressions of the gridded stretchers below; the areas of varying saturation which, in their slight inconsistencies, reaffirm the physical nature of Metz’s technique. As we move away from the canvases, however, our attention gradually shifts to the larger arrangement. Metz has designed the show to function as a single ruptured phrase: like a musical ostinato, the work unfolds in a winding loop, the cycle gradually gaining a sense of movement through the careful alternation of accents and rests. 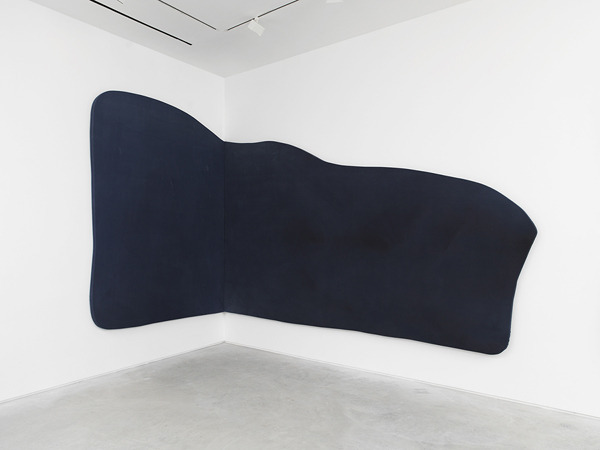 Because of its scale, the work is too broad to be grasped all at once; instead, it forces the viewer’s gaze to move edgewise across its perimeter, her focus shifting rhythmically between the deep blue of the paintings and the bare white of the surrounding architecture, which quickly takes on a weight of its own. Indeed, the longer one views the work, the more she finds her sense of the larger composition affected by the particulars of Fuentes’ gallery space: not only the gaps between the canvases, but also the two doorways, the wall divider, the structural pole. As the surrounding environment begins to claim our attention, an interesting shift in perspective takes place: despite their treatment and formidable scale, one finds in time that the canvases – ostensibly the show’s centerpiece – actually begin to recede in prominence, their function gradually changing from one of occupying the space to that of articulating it. Indeed, as our focus broadens, we grow increasingly aware of other elements at work, both physical and ephemeral, which might have otherwise gone unacknowledged: the time it takes to walk the perimeter; how ones own pace dictates that of the work’s unfolding phrase; how physical distance affects its perceived composition; the extent to which ones readings of the canvases – their scale, their perceived mass – is defined by light, shadow and the expanses of white wall, each of which assume their own shifting weight and form. We become mindful, in other words, of the viewing experience as an embodied event unfolding in real time. The insistent drones of La Monte Young; the willful monotony of Warhol’s films; the arc-opposed choreography of Yvonne Rainer; the plot-negating novels of Alain Robbe-Grillet; and, of course, the musical offerings of John Cage: in each case, we find artists emphasizing real-time elements inherent to the viewing ritual, confounding expectations of narrative by taking an open-ended approach to structure. Conceiving their works less as rigid scores than unfolding situations, each willfully subverts authorial influence by embracing elements both notated and incidental, the presentation transformed from an act of mere culmination to one of active, autonomous, ongoing invention. It’s an approach which, in its curbing of intention, rejects the very notion of “arbitrary elements”: embracing all as necessarily vital, it recasts hierarchical distinctions – between subject and setting, positive and negative space, even art and not-art – as matters of perspective, functional in practice but never fixed. Within this model, no circumstance can be presumed incidental, no factor elevated, no surface, form or environment neutral beyond its relationship to what surrounds it; though individual facets may seem emphasized, they are at once defined and enhanced by their place within a broader arrangement. By taking on a similar approach to painting, Metz confirms more literally what has been a longstanding theme in his practice: namely, the principle of interdependence, that condition by which perceived divisions between elements are leveled to reveal an underlying, reciprocal union. To date, Metz had explored these ideas primarily through his studio process: his choice of materials, his techniques of application, and so on. Never before, however, has he so directly applied them to his strategies of presentation. While still clearly reflected in his output – the show’s elegant arrangement; its retention of familiar procedures and forms; the incidence left evident in the canvas’ surface – Metz goes out of his way here to enfranchise his audience, eschewing designated points of entry and vantage, even leaving the work physically unrealized so as to depend, both figuratively and literally, on viewer perspective for its completion. On one level, then, we find Metz engaging the exhibition space as he would his own studio, imbuing the work’s public presentation with a similar allowance for surprise and discovery. But in another, broader sense, these strategies ultimately speak to the inherent capriciousness of the formal viewing experience. Perhaps more than any of Metz’s previous efforts, this work embodies the principle that defined our second authorial model: namely, the notion that art’s value lies in the breadth of experience it accommodates. Meaning, after all, never remains static: audience subjectivity, varying contexts, and the passage of time each and together ensure a range of content beyond a work’s prescribed reading; whatever significance art does acquire is cumulative, the sum of perceptions that shift continuously, vary from person to person, and needn’t have anything to do with authorial intention, institutional instruction, or even the viewer’s own previous impressions. As such, there can be no neutral presentations, no final iterations, no fixed or “correct” readings. There is only the work, which endures outside of expectation, untethered to particulars and perpetually open to (re)discovery. Saul Bellow once remarked that, at its most resonant, “art has something to do with the achievement of stillness in the midst of chaos… an arrest of attention in the midst of distraction.” (13) With this latest work, Metz provides his viewers the means for a similar insight. Though attained through strategies of erasure, the effect here is sensual, meditative and, finally, affirmative, the artist’s silence used to promote reception rather than hinder it. In encouraging a state of bare attention, then, the work ultimately confirms what is true both in- and outside of art: that the value of our experience lies not in the quantity of what we receive, but in the quality of presence we bring to what’s there. (1) Rauschenberg, Robert. As quoted in Random Order: Robert Rauschenberg and the Neo-avant-garde by Branden Wayne Joseph. (Cambridge, MA: MIT Press, 2003). Pg. 21. (3) Deleuze, Gilles. Francis Bacon: The Logic of Sensation, trans. Daniel W. Smith. (New York: Continuum Books, 2003). Pg. 71. (4) Cott, Jonathan. Susan Sontag: The Complete Rolling Stone Interview. (New Haven: Yale University Press, 2013). Pg. 57. (5) Meyer, James. “Carl Andre: Dia:Beacon.” Artforum, September 2014. Pgs. 365-66. Print. (7) Barthes, Roland. The Pleasure of the Text. (New York: Hill and Wang, 1975). Pg. 6. (8) Pasler, Jann. Writing through Music: Essays on Music, Culture, and Politics. (Oxford: Oxford University Press, 2014). Pg. 80. (9) Sontag, Susan. “The Aesthetics of Silence.” As published in A Susan Sontag Reader. (New York: Farrar, Straus and Giroux, 1982). Pg. 184. (10) Tomkins, Calvin. Marcel Duchamp: The Afternoon Interviews. (Brooklyn: Badlands Unlimited, 2013). Pg. 30. (11) Cage, John. “James Joyce, Marcel Duchamp, Erik Satie: An Alphabet”. As published in X: Writings ’79-’82. (Hanover, NH: University Press of New England, 1983). Pg. 101. (12) Morris, Robert. “Notes on Sculpture, Part 2.” Artforum, October 1966. Pgs. 20–23. Print.